We are registered with the Information Commissioner’s Office. The company registration number is ZA361881. We are committed to keeping our information up to date, as far as is reasonably possible. However, if you believe that we have made an error, then please contact us at: finance@emka.co.uk and we will immediately correct any inaccurate information. However, when there are statutory or legal requirements to do so, we will retain relevant sections of your personal data for a set period of time for accounts and records purposes. 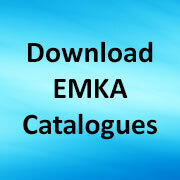 EMKA (UK) Limited is committed to keeping all collected personal information secure to protect it from being inappropriately or accidentally accessed, shared, destroyed, and against it being compromised, in any way. To that end, our IT systems have been reviewed and independently assessed to be of a high technological standard in order for us to provide assurance that your information is handled securely at all times. In certain circumstances, we may send your personal/sensitive information to EMKA Beschlagteile GmbH. We use a GDPR-compliant email service to provide our marketing preference service which allows you complete control over what you would like sent to you, at any time. This ensures that we send you only what you have consented to so you are in charge.